When I started this blog over three years ago, I did it because the topic interested me and I thought it would be fun. I wasn’t sure what to expect in terms of reception, but it was actually pretty good! People found the site, passed links to it around, and editors at a few magazines and websites thought my writing was worth paying for. And so I shall. I’ve spent the last few weeks writing a big, formal proposal for a book about the psychology of video games –about 10,000 words1 describing the idea, why I’m the person to write the book, the target audience, the competition, how I’ll market and promote it, and detailed descriptions of all chapters. I’ve also got a complete sample chapter that looks at what anonymity and freedom from consequences do to us while playing games online. If you’re a literary agent, I could send these to you IN UNDER FOUR SECONDS were you to contact me. The book will have the same tone as this website,2 but I’m going to really dig in and research the topics more and use the available space to explore them. Topics will include anonymity, avatars, cheating, fanboys, nostalgia, competition, quest completion, loot grinding, immersion, violence, digital sales, subscriptions, microtransactions, and more. Readers will take away an understanding of how the psychology behind video games affects them, and what they can do about it to make games and gaming communities better. Designers and community managers will also learn how to use these lessons to do the same. 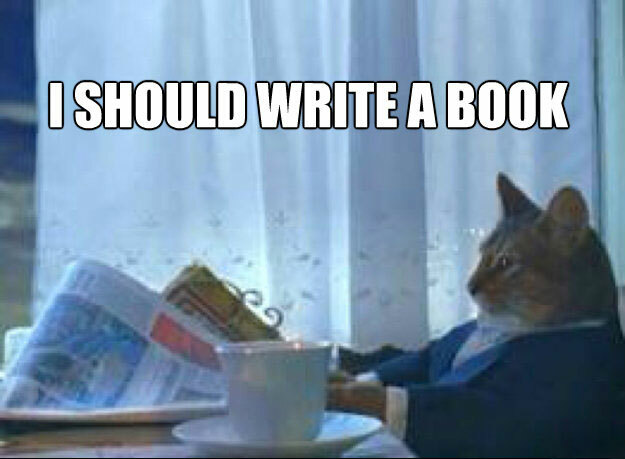 I’m trying to find a literary agent to represent me and sell the proposal to a publisher. The main thing that both agents and publishers look for is what’s called an author’s platform. It’s essentially an author’s built-in audience and network of contacts that can be used to market and spread the word about a book. Follow me on Twitter, Facebook, and RSS. Those numbers are super important to show I have an audience. Share a link with someone. Tweet, share on Facebook, or whatever. Don’t spam people, but if you know of someone who might like this site, send them a link to it. Comment on the articles if you have thoughts. An active community is an attractive community, and you look fabulous. Let me know in the comments section here what topics you’d like to read about in a book like this. I’m curious as to whether I’ve covered the right bases in the proposal. Are you a literary agent or do you know a good one? If so, use the contact page to pass along contact info (professional/work contact info only, please). My book proposal and sample chapter are ready to go, or I could send a shorter query letter. Are you an editor at a magazine or blogging network like Discover, Wired, Slate, etc.? I’d love to hear from you about doing some guest blogging to help build my audience. Are you the same at a big gaming site like Kotaku, Joystiq, IGN, Gamespot, Eurogamer, etc.? Same request. Let’s talk. Are you a researcher doing work in any of these areas? Want to get the word out on it? Let me know! So there you have it. It’s going to be a long process and I’m going to need your help to succeed, but it’s going to be fun! P.S., Don’t worry. Regularly updating this site is also key to building my platform, so you’ll keep seeing new stuff here for free. In fact, it may happen more often as I come across cool stuff in my research that I can’t find a place for in the book. 2. Right down to these stupid footnote jokes. For starters, I am excited about this book. Topic suggestions/ideas – gender. As a female gamer, it think it’d be great to somehow address stereotypes vs. women and/or the assumption that all players are male. That and how language/behavior towards women is generally negative and sometimes degrading. I have been a devotee follower of your work for about 2 years now. I have downloaded and printed most if not all your articles, re-read it multiples times, and have referenced much of your writings in my work. Something worth mentioning, is following up on your articles on ‘Reality Is Broken: Why Games Make Us Better and How They Can Change the World’, social identity theory, and ideal self image on how can we can utilize video games a medium to unify the gaming culture. You made such a valid point that people have a tendency to construct identities based on group membership which divides gamers into groups of consoles, genres, and even genders. I believe our ideal characteristics is to be in fellowship with one another as gamers to do revolutionizing things like in McGonigal’s book. Though I feel their is an underlining principle in that our online representations and gameplay can affect our behavior, that has yet to be tapped into. I feel you can find that link that can spark the vision so many people at Games for Change and around the world are trying hard to create. I’m planning a chapter on fanboyism (and fangirlism) that will explore some of that stuff. I completely support this! I wrote my dissertation on verbal reasoning and casual puzzle video games, so my recommendation (read: bias) would be to discuss positive benefits from playing games. There’s a massive positive psychology-esque movement on this with brain training/fitness games, games being used for medical and physical rehabilitation, etc. If you wanted to jump off the deep end, including the opposing argument (violent games are bad) might also be another topic/perspective to include. Thanks. I currently plan to cover some of the therapeutic applications of games a few different places. There’s lots out there on it. I’m a huge fan of the site and rather interested in the notion of a book. Failing everything else you mentioned, could you kickstarter (erm.. kickstart?) this instead? Doing a Kickstarter and/or self publishing are Plan B. I’d like to give the more traditional route a try first because a publisher can help me edit a book, market it, and get it in front of people. His blog and yours are easily my favorite reading on game design. Awesome! Can’t wait for it to be sure. If you do happen to feel the odd writer/artist anxiety, check out this talk if you haven’t already! Funny as hell. I think doing a really good study of violence in video games is an important subject to look at. The “serious” games genre is a great step forward for games but if we are to say that these games can and do help people to become more informed and learn new traits and habits, we seem to opening ourselves up to attacks on the extreme violence found in a lot of games. Are violent video games influencing us to be more violent, if only mentally, in the real world? I know you had already mentioned this but just wanted to put my vote in! Have fun! for therapeutical / transformational purposes, I found Jane McGonigal’s Site Superbetter.com to have a very good concept – although it’s more gamification than gaming per se. Yes! Instant buy. As a psychology undergraduate, I spend most of my free time gaming/looking at news about videogames, and I love that this site combines my two passions. I can’t wait to get this book. Please make it happen. I work in psychology, with younv people who play a lot of games and am a writer. Would love to hear more!